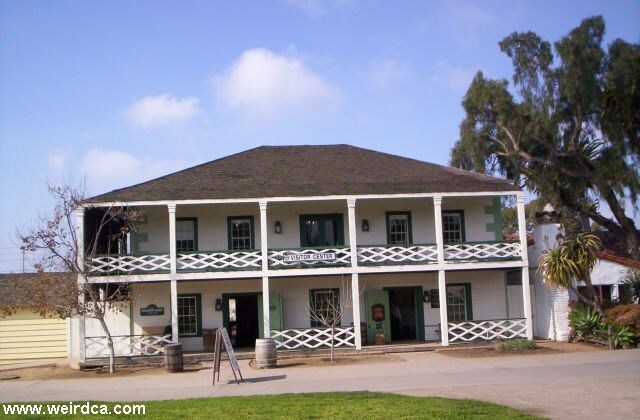 Located in Old Town San Diego, the Robinson Rose House is a replica of the original building that was on the site. The original was built in 1853. The replica now serves as the visitors' center and park headquarters for Old Town. Additionally it houses a very detailed model of Old Town. The house was built in 1853 by James Robinson who used the building as both his residence and to house several offices. Robinson died in 1857 and the residence was sold by his wife to Louis Rose. Fire destroyed the roof in 1874 and the house slowly deteriorated afterwards. The reconstructed building is what sits there now. The house supposedly has problems with the electricity as lights will go on and off by themselves and the elevator will start and stop on its own. Footsteps have been heard upstairs at night and a man has been seen at the upstairs windows. There have also been reports of women having their hair mysteriously pulled or touched.